Though Forex market is well known, there are still some people who have little idea about it. What is Forex Market, Why to Trade in Forex? Today in this chapter we will understand about what is forex market and the financial instruments to trade in forex market. Forex Market known as Foreign Exchange Market is where individuals, companies, and institutions buy and sell, speculate or exchange currencies. It is where the sale and purchase of foreign currencies take place and where anyone with capital can trade. When it comes to forex trading, there is no limit and experience is your key to success. Some make profits from the fluctuating rates of currencies, and these fluctuations are the result of changes in demand and supply. Forex market involves global brokers and worldwide computer network around every corner of the world. Currency market is one of the biggest market in the financial world. There are almost trillion dollar transactions happening every day. For those who are new in trading forex trading is different from stock trading. For Example: when the demand for U.S Dollars increases its value will also increase. There are three main sources where currency trade takes place. Firstly at foreign trade, where companies or individuals buy and sell products in different currencies. During this foreign trade either companies make profit or loss due to difference or change in currency rates. 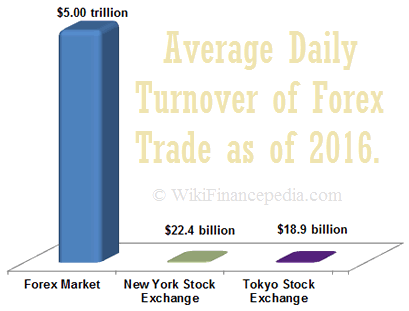 Overall only 5% of forex trade takes place through foreign trade. Secondly traders and speculators participate majorly into forex trading. Overall 70% of the forex traders are performed by investors, traders, hedgers and speculators. Lastly remaining 25% of traders are executed by central banks, governments, etc. Out of all the currencies, most traders in currency market are carry in US Dollar, Canadian Dollar, Japanese Yen, Euro, Swiss Franc, Indian Rupee and British Pound. As per Greenwich Mean Time (GMT), forex trading hours make headway worldwide. For example: forex market is open in New York from 01:00 pm – 10:00 pm GMT; at 10:00 pm GMT Sydney market is open; Tokyo is available between 00:00 am to 9:00 am GMT, London opens at 8:00 am and closed at 05:00 pm GMT. This way complete the loop across the world for forex trading hours. Forex is one of the highest traded financial instrument in the world. Around daily transactions of $5 trillion USD are taken place. Investors and traders quickly turnaround with the currency fluctuation every day due to which other financial markets are not as highly traded as compared to forex. Here we will list out different segments through which you can trade currency in the Forex Market. At spot market prices are quoted at the moment in time where it got his name. A broker gives a spot price that the trader has to follow then start the trade if he or she is interested and it will most likely take two days for the transaction to deliver. Spot trading is very common type of currency trading. Buyer / Seller agrees to exchange currency at the future date at the future value. The broker and trader will quote the price depending on the value of the currency in the future. It would usually take six months to fix the details but may differ in other countries. In some countries trade duration can be one month, three months or one day as well. Depending upon duration of the currency exchange, forward contracts are then negotiated between parties. Similar to forward contract, broker and trader fixes the price based on the future value of the money. Dealing will include fixed maturity date and a fixed contract size. Usually duration of future contract is of 3 months and settled at a specific date. Due to which in terms of obligation between the parties are similar to forward contracts. This type of trading is mainly participated by traders, investors or fund managers to hedge their open positions. The most widely recognized kind of forward exchange is the swap trading. In this, buyer and seller exchange currency for a specific period of time and consent to turn around the exchange at a later period. These are not exchanged traded or not institutionalized contracts. A deposit is frequently required keeping in mind the end goal to hold the position open until the exchange is fully completed. An alternative derivative for forex trader is option trading. In this buyer has the privilege however not the obligation to trade another currency at the pre-agreement price on a predetermined date. Forex options is one the most liquid and biggest market for option traders in the world. Currencies are always traded in pairs, and most traders stick to some well-known currencies such as USD, EUR, GBP, JPY, CAD, and CHF. One can have a CAD-USD dollar pairs shown as CAD/USD. As a trader one should be stronger enough in analysis for choosing currency trade with the intension to make a profit. It is advisable to protect yourself with stop-loss order when trading due to the risks involved in the Forex Market. There are demo accounts used by forex broker that are similar to real accounts. These can be used to trade with virtual money, and there are also some online and offline resources available to get information. As an investor or a trader, you should firstly participate in virtual trading before investing your capital to analyze your analytical skills.